Here’s an update about one of the “Holes in Pescadero.” Some time ago I posted a story called, “The Hole in the Wall.” That’s the hole in the rocky promontory that bounds Pescadero Creek, at the point it enters the ocean. I had originally thought it was “Pescadero’s Pride and Joy,” the most viewed Sea Arch on the coast. 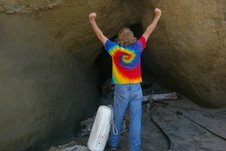 Then a friend told me, while looking at a picture of it on the California Coastal Records Project (CCRP) site, that he and his partying buddies had called it the “Hole in the Wall Beach,” back in the Seventies. And that it had been more obviously hand dug at that time. as it is for a good part of the year. Its manmade nature isn’t real obvious after years of crashing surf. However, earlier this year, while visiting Four Mile Beach, in Santa Cruz County, I photographed this obviously manmade, rectangular hole, in a promontory at the opening of the creek. This is the hole, both looking from the oceanside and the lagoonside. By looking at Picture # 6415 on CCRP you can see that this hole was also an attempt to relieve the lagoon behind it. I’ve attached a screen grab of the large file in which I’ve marked the location of the hole with a black bar. That’s a surfboard leaning against the cliff next to it. If this technique was used in at least two different watersheds, it must have had some success or the word would have spread. Nobody likes to be laughed at, and especially about something that would take so much work to dig and would last for decades as a reminder of your folly.